The Rock Spa at The Metropole Hotel01597 823700work SpaA magnificent 18m heated swimming pool with whirlpool spa and luxurious Sauna and Steamroom. The gym contains the latest aerobic and cardiovascular equipment linked to your individual TV and sound system. Our professionally trained staff can assist you in the use of this equipment and set up fitness programmes. A varied selection of holistic treatments is available with professional, caring and fully trained staff. The air conditioned gymnasium offers a variety of fitness equipment including Star Trac running machines, cross-trainers, bikes, stepper and rowing machine. All cardio vascular machines have their own individual TV’s and our fully-trained staff are happy to draw up individual fitness programmes to meet the specic needs and requirements of our guests. Refresh yourself and enjoy the ultimate cleansing, relaxing and rejuvenating experience at The Metropole. Luxuriate before or after a treatment or simply enjoy the enormous benefits of the thermal spa experience as a treatment in itself. Benefit your well-being from warm, dry and wet heat, steam and Jacuzzi or simply relax on our pool side loungers. Enjoy the warm massage jets of the Jacuzzi heated to 38-40 degrees Celsius. Our sauna, with dry heat and aromatic essences, improves circulation and clears the body of toxins and our fragranced steam room leaves skin hydrated and glowing. Browse an extensive list of spa packages and experience a blend of holistic treatments and spa activities that are just right for you. We offer a wide range of treatments from hot stone massage and reexology to manicures and waxing. This includes the ever popular Indian head massage that will soothe your furrowed brow and take away the strains of modern day living. Spa days at the Metropole offer the perfect antidote to the stresses of working and family life whether you are celebrating a hen party, birthday or anniversary, or are just in need of some serious pampering, our indulgent range of relaxing treatments will leave you feeling refreshed and revitalized, ready to face any challenge in your life. 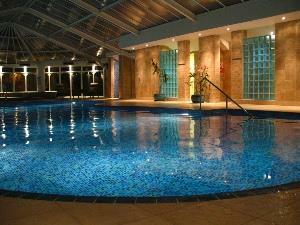 A magnificent 18m heated swimming pool with whirlpool spa and luxurious Sauna and Steamroom. The gym contains the latest aerobic and cardiovascular equipment linked to your individual TV and sound system. Our professionally trained staff can assist you in the use of this equipment and set up fitness programmes. A varied selection of holistic treatments is available with professional, caring and fully trained staff. Enjoy sitting with your feet up reading the papers, delight in the pleasures of one of our holistic therapies or burning off the calories, the choice is entirely yours.